Select a flank of mutton or carefully remove meat from a leg of mutton and roll it out flat. Sprinkle it with salt, white pepper and cilantro. Slice two onions and fry in oil until transparent. Add cleaned and chopped bacon. Season with salt, pepper, nutmeg, saffron and a little cinnamon. When the bacon is cooked, remove from heat and add breadcrumbs and grated cheese Mix with slightly beaten raws eggs. 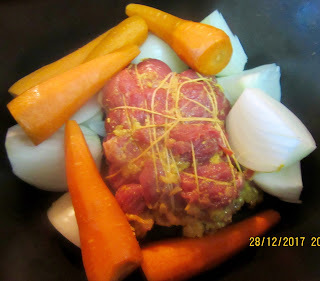 Place the mixture on the flank of mutton and roll the flank shut. Tie it well to prevent the stuffing from falling out. Select a large pot and put the mutton in it. Cover with water. Add peeled 2 whole onions, and peeled carrots. Add olive oil, salt and cinnamon tubes. Bring to a boil. Reduce heat and gently boil for two hours. When the meat is cooked, remove it from the pot and put it in an earthenware casserole dish. Put it in the oven and brown. In the meantime remove the whole onions and carrots. Grind them in a food processor. Add 1 liter of the broth, walnuts and honey. When the meat is ready, serve it with the sauce. If desired the broth can be served as soup with slices of bread. 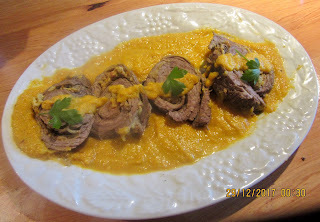 See blog titled “cabra,” published April 6, 2012 for the Medieval Spanish Chef’s version of this recipe. 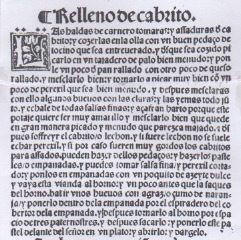 See blog titled “falda,” published November 7, 2014 for the Medieval Spanish Chef’s version of this recipe. 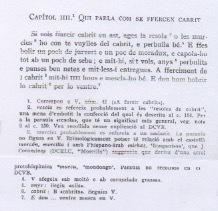 The Sent Sovú recipe calls for a stuffed whole ram or kid but as these are not readily available today, this version of the recipes is adjusted for a flank of beef.